Periodontal disease (also known as gum disease) is a very common oral health condition that infects and damages the gums and bone that support your teeth. This occurs because of plaque, the sticky, bacteria-filled substance that’s constantly forming in the mouth. If plaque isn’t removed with brushing and flossing on a regular basis, it can quickly develop into hard deposits known as tartar (or calculus), which begin to destroy healthy oral structure. Many patients don’t even realize they’re suffering from periodontal disease until it’s reached an advanced stage of growth – that’s why attending routine check-ups with a seasoned, trustworthy professional like Dr. Catherine Cech is so important. Contact our Manchester Center practice today to schedule your first appointment. Periodontal disease isn’t only the number one cause of tooth loss among adults – it also has potential links (suggested through research) to a variety of overall health problems, including diabetes, heart disease, pregnancy complications, strokes, and more. Overall, maintaining a good diet, a strong oral hygiene routine, and attending regular professional check-ups and cleanings can help patients from Dorset, VT and surrounding areas minimize their chances of experiencing this condition. 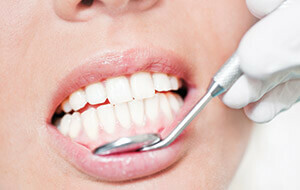 There are several treatment solutions for periodontal disease, depending on the severity of the patient’s condition. They include in-depth cleanings known as scaling and root planing, surgical treatment, or the use of antibiotic therapy. Antibiotic therapy can actually be used in conjunction with these treatments to ensure even more bacterial reduction and accelerated healing for patients. There are several types of antibiotic treatments, including both oral medication and gels that can be applied right onto the gum pocket. These techniques have been shown through research to be highly effective in treating several types of periodontal disease, and Dr. Cech can either prescribe them for short-term or long-term use in order to keep dangerous bacteria from accumulating after treatment. Our team offers both Arestin and Periostat for patient use. If there are areas in the mouth that don’t respond to conventional hygiene, we have a soft tissue laser to aid in decontamination of pockets and remove destructive bacteria. This is a simple procedure that can be done during your routine hygiene appointment and requires minimal topical numbing gel. Our goal in offering patients this adjunctive therapy is to keep your mouth healthy and prevent more costly gum procedures.